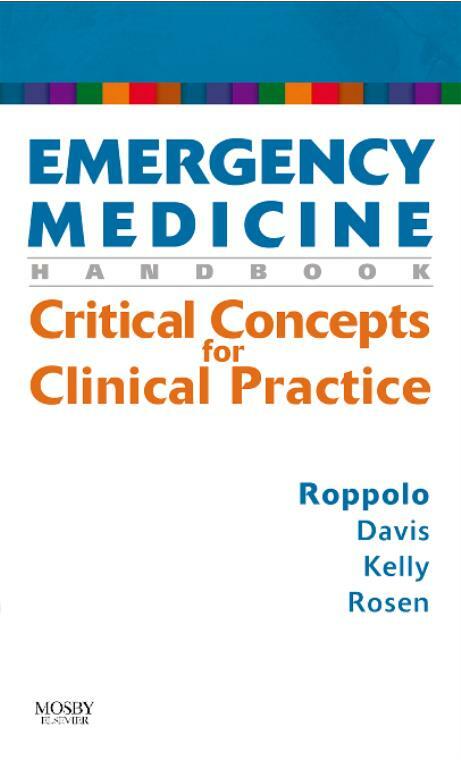 Emergency Medicine Handbook: Critical Concepts for Clinical Practice provides essential information and practical advice for use in the emergency department. The book covers the general approach to patients with various medical complaints, tables of differential diagnoses, and brief discussions of the most common disease processes-all in an easy-to-read, bulleted format. Essential information for use in the busy EM department. Roppolo, Lynn Assistant Professor of Surgery, Division of Emergency Medicine, University of Texas Southwestern at Dallas, Dallas, TX. Davis, Daniel UCSD Medical Center - Hillcrest, University of California, San Diego, San Diego, CA. Kelly, Sean Attending Physician, Department of Emergency Medicine, Beth Israel Deaconess Medical Center; Instructor, Harvard Medical School, Boston, MA. Rosen, Peter Attending Physician, Department of Emergency Medicine, Beth Israel Deaconess Medical Center, Boston, MA.